Providing you the best range of foam gaskets with effective & timely delivery. We are offering Foam Gaskets to our clients. 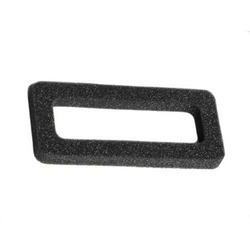 Foam or sponge gasket is a generic term covering a range of parts made from different closed cell foam rubbers. These materials are commonly used to manufacture equipment seals; dust, moisture and splash seals; lid seals; various kinds of filters, and speaker gaskets.